Aerial photo of an airstrip in the town of Batangas. Image source: United States National Archives. Up to the present day, there are still people who refer, at the very least in Nasugbu and Batangas City, to places in their respective towns simply as “Landing.” Many do not even know how such places came to be so named, albeit unofficially. In the early days of aviation in the Philippines, during the American colonial era to be precise, the aircraft that flew in the country were all propeller-driven and, thus, did not need lengthy runways to land on. These were used by the military, by wealthy businessmen and by the postal service, among others. Many of these were single-engine planes that could set down even on grass fields. Because these aircraft had limited range, there were many airstrips of varying quality around the country where these airplanes could set down to deliver and load passengers, mail or parcel and, most importantly, refuel so they could take to the air again. Although strictly speaking, these locations from which aircraft operated, whether civilian or military, were called aerodromes (British English) or airdromes (American), they were also loosely referred to as airstrips or landing fields1. This, therefore, is the etymology of the places in Batangas City and Nasugbu – and possibly elsewhere in Batangas – which people simply refer to as Landing. In 1936, an Executive Order issued by the President of the Philippine Commonwealth formally classified these aerodromes into a) national airports; b) national emergency landing fields; c) provincial airports and landing fields; d) municipal airports and landing fields; and e) military airports; f) private airports and landing fields2. In Batangas, the landing fields listed were those in the town of Batangas, which incidentally was classified as a national airport; as well as the private landing fields in Calatagan and Nasugbu. An amended version of this Executive Order issued in 1940 listed the Batangas airstrip as a Commercial National Airport and also listed Nasugbu and Calatagan under Private Airports and Landing Fields3. We know from hindsight that an airfield would be built in Lipa – two, in fact, but more on this later – and that this would ultimately become what is known in the present day as Basilio Fernando Air Base. What is little known is that there used to be a landing field in Tanauan, Batangas – not to be confused with Barradas Airstrip of the present day – and that Lemery was also scouted for a possible landing site. Landing field in Batangas Town, date taken unknown. Image source: United States National Archives. As mentioned, there was an airstrip in the then-town of Batangas that was first categorized as a National Airport in 1936 and then reclassified as a Commercial National Airport in 1940. 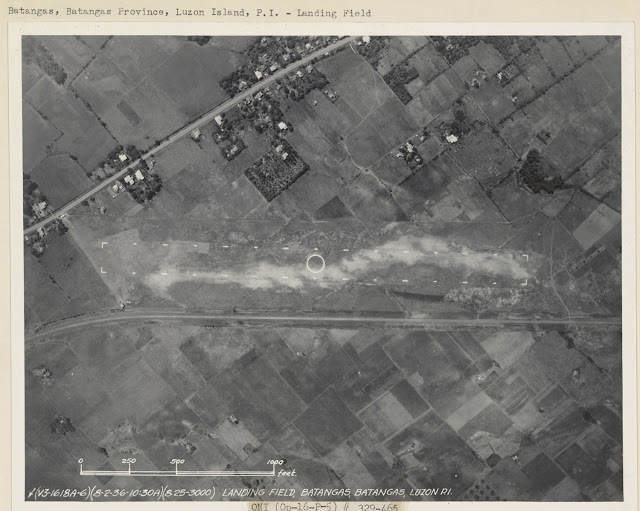 Many accounts of World War II action in Batangas also mention a “Batangas Airfield” from where the United States Army Air Corps (USAAC) and the Philippine Army Air Corps (PAAC) operated. The web site Pacific Wrecks4, for one, states that the airstrip was located north of the town of Batangas and that both the USAAC and the PAAC used it in 1941. What Batangas History is unable to state categorically is if this was the same field that a year before was categorized by Executive Order as a Commercial National Airport. That same document did not list Batangas among the sites of five military airfields in the Philippines, although it is entirely possible it was converted to military use because of the worsening geopolitical conditions of the time. 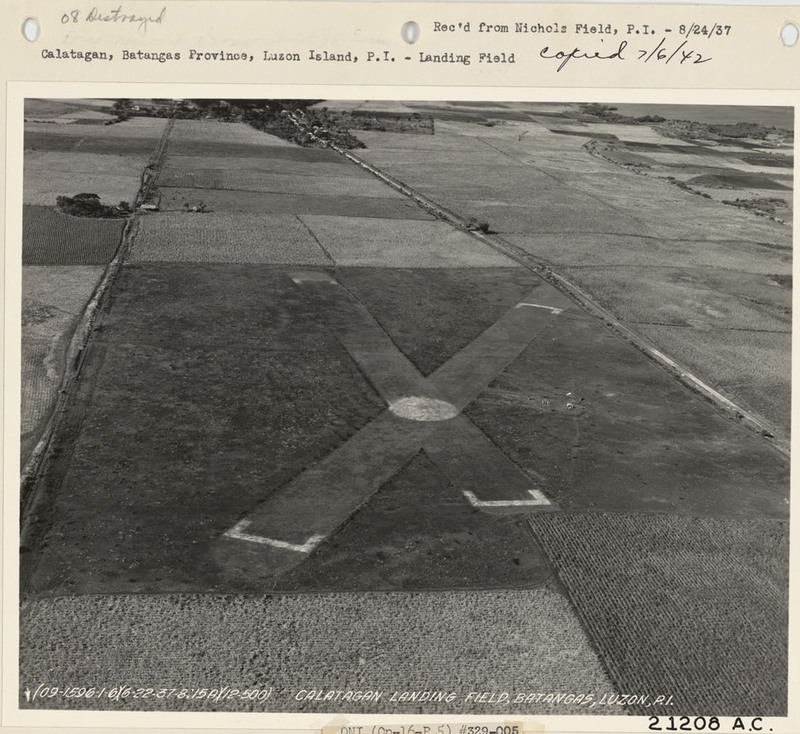 Above is a photograph taken of a “landing field” (as said in the original caption) in Batangas from an airplane flying directly overhead. The picture was downloaded from the United States National Archives. Unfortunately, the accompanying caption was sketchy and did not state what year it was taken or the location’s coordinates. 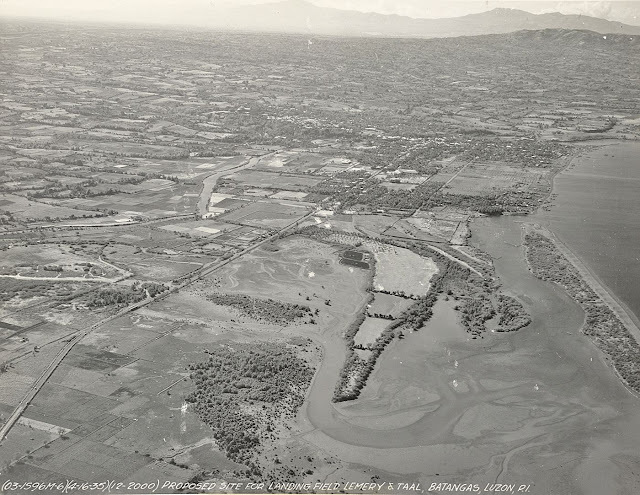 Aerial shot of the Calatagan Landing Field, taken 1937. Image soruce: United States National Archives. According to Pacific Wrecks, the landing field in Calatagan was built before World War II and served as an emergency landing field5. The 1936 Presidential Executive Order defined such a field as “All landing fields constructed or to be constructed along the air routes as a safety precaution in case of forced landing.” In both the 1936 and 1940 Executive Orders, however, the Calatagan Landing Field was classified as “Private,” and this makes Pacific Wreck’s statement somewhat contentious. At any rate, Pacific Wrecks says that the landing field in Calatagan was in an “area planted with sugarcane,” something evident from the picture above which was downloaded from the United States National Archives. It was taken on 24 September 1937 by an aircraft reconnoitering the area from Nichols Airfield. Aerial shot of the Nasugbu Landing Field taken in 1937. Image source: United States National Archives. The Nasugbu Landing Field was also known as the Nasugbu-Roxas Aerodome and was owned by the company Roxas y Cia. It had two intersecting runways and its surface was “grass with dirt,” the runways whitened so these would be visible from the air. The picture above was taken on 7 November 1937 by an aircraft flying from Nichols Airfield. It has been downloaded from the United States National Archives. 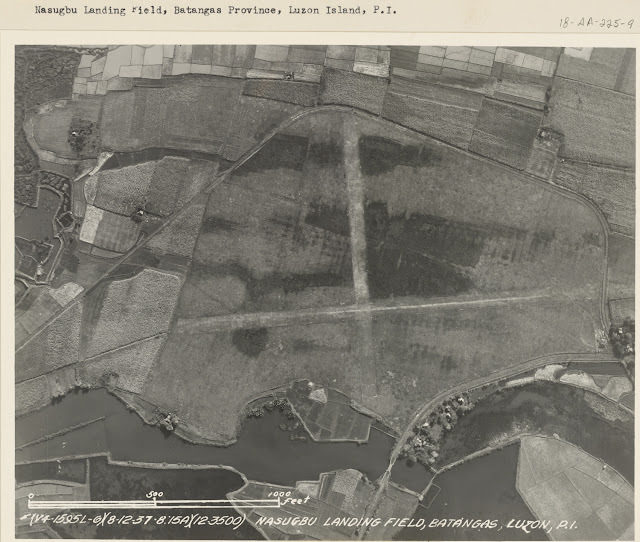 Possible Lipa Landing Field, photo taken in 1934. Image source: United States National Archives. There have been accounts saying that the Lipa Airfield was built by a corps of United States Army engineers prior to the Japanese occupation, abandoned after General Douglas MacArthur ordered American and Filipino Forces to retreat to Bataan and then taken over by the Japanese. It is noteworthy that this airfield was not listed in either the 1936 or 1940 Presidential Executive Order, so could have been built after the latter was issued. 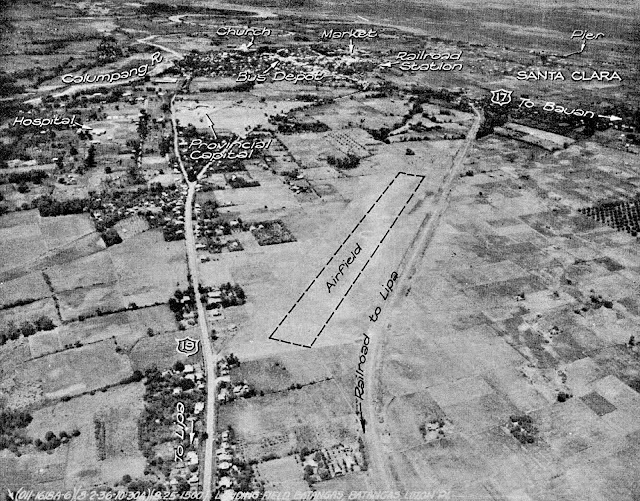 The Japanese improved on the base, which was called Lipa West Airfield; and built a second but smaller one close by, the Lipa East Airfield. The Americans would reclaim the Lipa West Airfield and develop it into an airbase which would ultimately become Basilio Fernando Air Base. 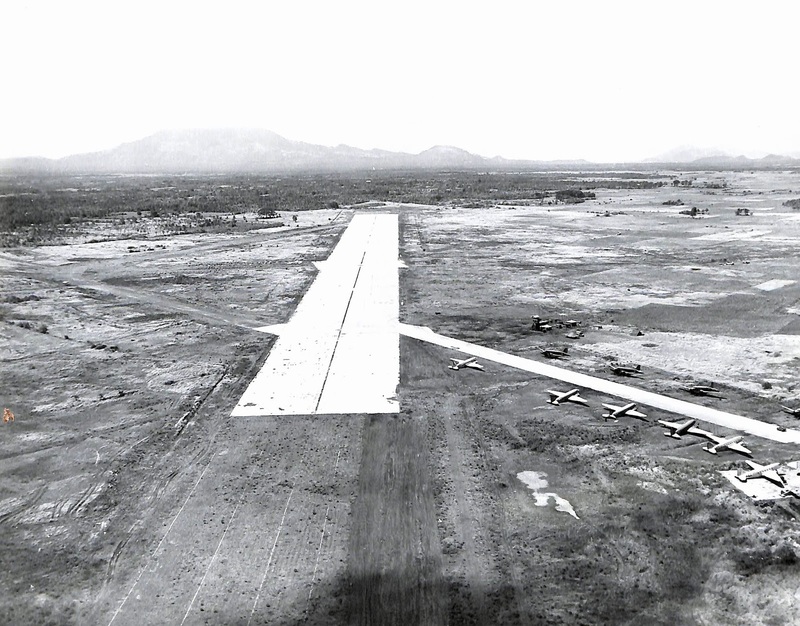 A more comprehensive review of Fernando Air Base’s history is available in this article: “Fernando Air Base: Its World War II Roots”. The picture above was taken over the then-town of Lipa by an airplane reconnoitering for a possible site for an airfield. Hence, the caption “Possible Landing Field.” This is, of course, ambiguous and could have meant that the photographer thought he or she was taking a picture of an already existing landing field. Below, however, is a photograph of Lipa Airfield after it had been reclaimed by United States Army forces in 1945. Lipa Airfield after it had been reclaimed by American forces in 1945. Image source: United States Archives. 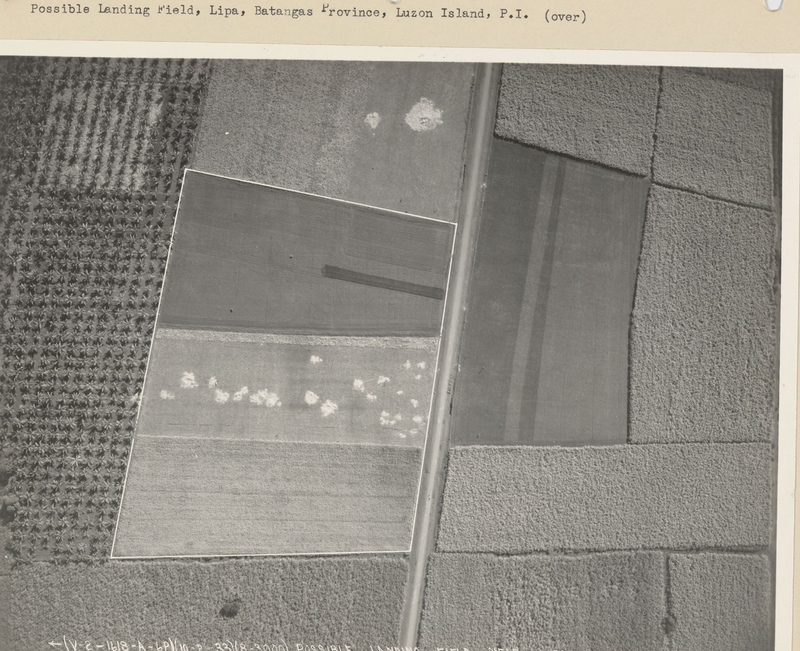 Possible site of Lemery Landing Field, taken 1935. Image source: United States National Archives. From the photograph above, which was taken in 1935, we are able to find out that either the Americans or the Philippine Commonwealth Government considered building a landing field in Lemery to serve the Lemery-Taal area. What Batangas History is unable to do, however, is find from Internet sources any documents that can confirm that the airfield was ever built. Unfortunately, Batangas History has been unable to find any photographs of this airfield over the Internet. 2 “Executive Order No. 73, s. 1936,” online at the Official Gazette of the Philippine Government. 3 “Executive Order No. 306, s. 1940,” online at the Official Gazette of the Philippine Government. 4 “Batangas Airfield,” online at Pacific Wrecks. 5 “Calatagan Airfield,” online at Pacific Wrecks. 6 “They Fought with What They Had,” by Walter D. Edmonds, published 1951. 7 “Tanauan Airfield,” online at Pacific Wrecks.